Christ Church was originally built as a chapel of ease to the parish church in 1843, is now the church of a separate parish. It was rebuilt in 1876 with money donated by Elizabeth Trotter, a local philanthropist who lived in Horton Place, which subsequently became the Manor Hospital in the 1890's. 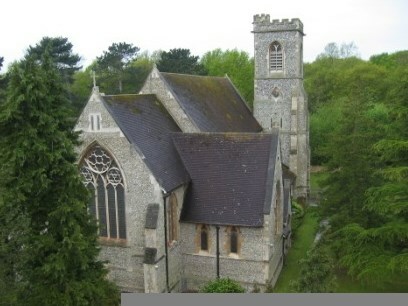 It is a small building of flint and stone situated on the edge of Epsom Common, and consists of a small chancel with a north transept and south organ chamber, nave of four bays with north and south aisles and a clearstory, and a south-west tower and porch. At the west end is a passage-way containing the font. There are eight bells by Mears & Stainbank, 1890. Take a rest with Maud Meyn ABCD-EFGH at the rear of the church. If anybody would like to expand this series please do. We would just ask that you contact sadexploration first so he can keep track of the Church numbers and names and to avoid duplication. Not far from this cache you can find the excellent ‘Gone Fishing’ series by Spring Chickens.